The Equality March in Washington, D.C., Sunday went off pretty much without a hitch, as did similar marches around the nation — but the same can’t be said of D.C.’s Capital Pride parade, held Saturday, which was disrupted by protesters objecting to the participation of police and certain corporations in the parade. Demonstrators from a group called No Justice No Pride engaged in “both a march of their own and a stand-off/blockade that resulted in the Capital Pride parade being re-routed and significantly delayed,” the Washington Blade reports. Ten protesters formed a chain to block the parade, necessitating the rerouting and resulting in a roughly 90-minute delay. While protesters and parade participants exchanged some harsh words, there was no violence, and no arrests were made, the Blade reports. 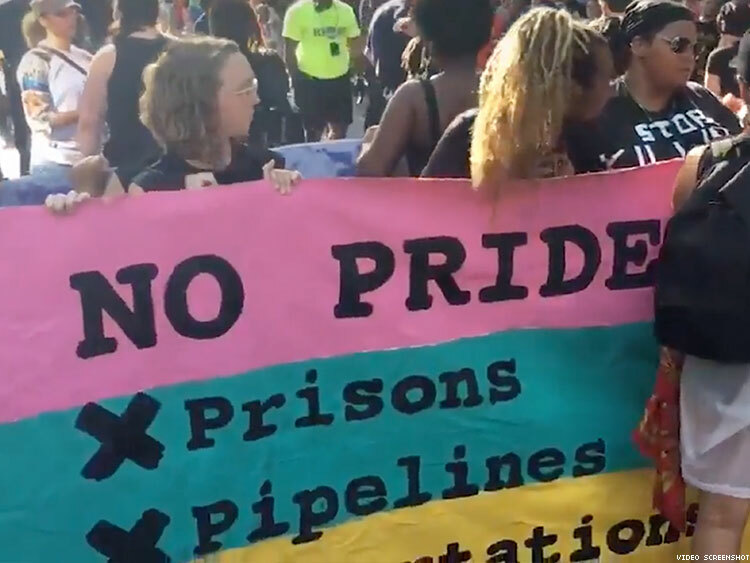 No Justice No Pride members say Capital Pride organizers have ignored the concerns of Native Americans and people of color generally, transgender people, and other marginalized populations. Another participant, Jen Deerinwater, contended that some of the federal agencies and corporations that sponsor Capital Pride are complicit in “native genocide,” such as the FBI, the CIA, Wells Fargo, Lockheed Martin, Northrop Grumman, and the Federal Bureau of Prisons. No Justice No Pride handed out fliers with a list of demands for Capital Pride, also available on the group’s website. These include barring police from marching in the parade and scaling back the presence of police on duty at the scene; “immediately cutting ties with Wells Fargo, Lockheed Martin, BAE Systems, Leidos, Northrop Grumman, and any other defense contractors” and “creating transparent and robust standards for screening corporations that wish to support Capital Pride”; putting trans women of color and members of other historically marginalized groups in decision-making positions, including a paid position for a native or indigenous leader; and acknowledging that the parade takes place on land belonging to the Piscataway nation. Capital Pride, asked by The Advocate for a response, emailed the following: "We engaged in discussions on Saturday night, but no one undertook any negotiations. That time and that setting were not conducive to engaging in a meaningful dialogue that properly involves the entire community. "The Capital Pride Alliance had repeatedly committed to continue to look at all the issues that have been raised, but we believe now is the time for us to work with other Washington, DC groups and broaden the conversation to find a way forward. After a weekend of events where hundreds of thousands of members of the LGBTQ+ and allied community came together to protest, gather in community, and celebrate, it is time for the full breadth of organizations and LGBTQ+ communities that they serve, protect, and advocate for to collectively look at the challenges and opportunities before us." Also, the Blade, in an editorial published before the parade, took stock of the disagreements between No Justice No Pride and Capital Pride, and considered several angles. The idea of barring police contingents from the parade is "an unfortunate demand that overlooks some important history," Blade editor Kevin Naff wrote. "Community activists have worked hard for decades to educate local police about LGBT concerns and to enlist the police as our allies. We take it for granted that the police will march in solidarity with us, but it wasn’t always so." "That’s not to suggest No Justice No Pride isn’t making some valid points," Naff continued. "Capital Pride leaders have said they would conduct a reassessment of how corporate sponsors are approved for 2017 and beyond. That’s a positive step." But some corporations, he wrote, have been key allies in the fight against "license to discriminate" legislation and have been ahead of government in enacting antidiscrimination policies. "Alienating and demonizing corporate allies is short sighted and ignores the powerful leverage they often have over anti-LGBT lawmakers," he added. "Of course, some companies walk the walk all year, while others give us a one-week rainbow embrace at Pride season. Capital Pride should do a better job of screening its sponsors and has pledged to do so."